waterfall Archivi - TSP S.r.l. Would you like to have a radio with a nice 40 “LCD display where you can view spectrograms, waterfalls and much more information? 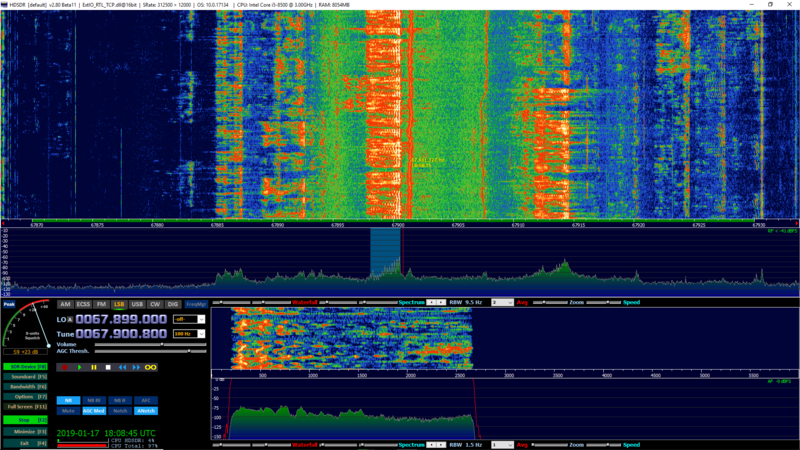 And what would you say to have a modern SDR radio so that you can listen to more signals at the same time? 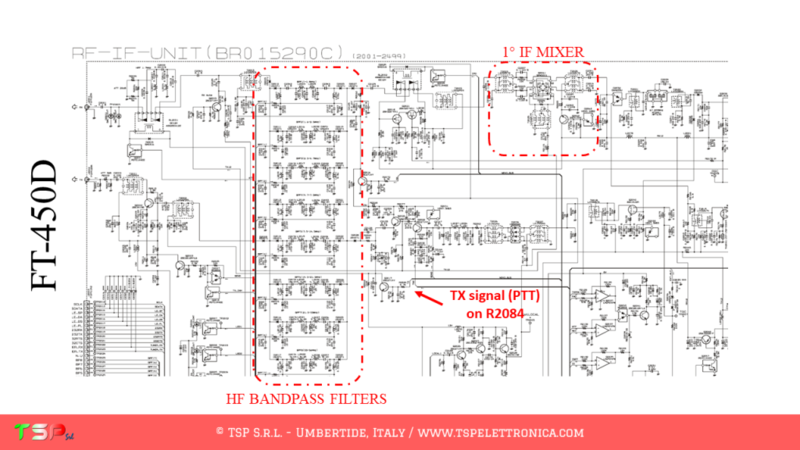 Wouldn’t it be nice to have many digital filters to improve reception during contest or DX activity? If you answered yes then IFace is the electronic card that allows you to have all of this without having to buy a new radio. How? By inserting it inside your “old” beloved RTX and using a cheap SDR receiver for computers (some suggestions here) such as an USB RTL-SDR dongles. IFace works with all the radios! Don’t you think so? Please watch this video and then keep reading. The idea behind this product is to continue to use the radio that we have purchased and which has already given us so much satisfaction. Surely we already have the CAT interface with which we control it from the LOG or from other programs and we also have the audio interface for the digital modes. But sometimes we realize that we would need a second receiver (for example to follow the +5 kHz or + 10 kHz of a DX station), band filters with steeper sides to eliminate a disturbance on an adjacent frequency or a notch because our radio does not have it or it is not automatic. All this can be a memory! So suppose to send the intermediate frequency signal (IF) of our radio to a dedicated SDR receiver and to start a program such as HDSDR (or SDR #, SDR Console …). On the screen of our computer we would have the spectrum display around the IF of our radio and, not to be neglected, we could also demodulate what it is receiving. But we could do even more, we could also demoulate other signals that are above or below the frequency tuned by our RTX. 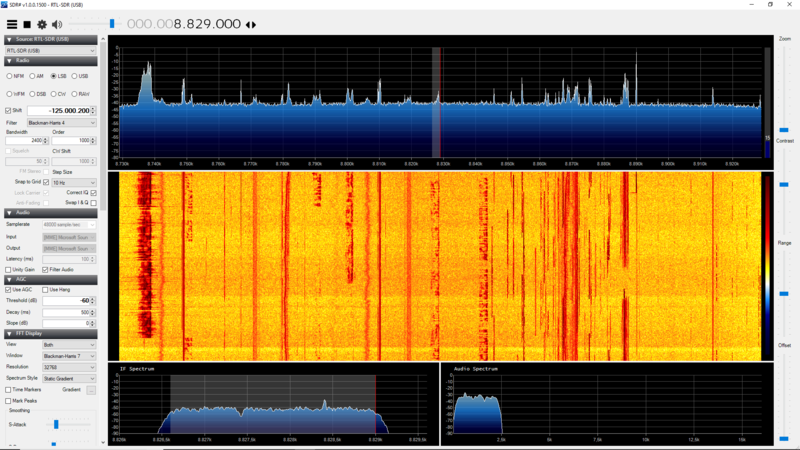 The image below shows a screenshot of HDSDR connected to an FT-450D via an RTL-SDR and the IFace. Reception at the IF frequency of a FT-450D though the IFace and a RTL-SDR. What needs to be done is very simple. 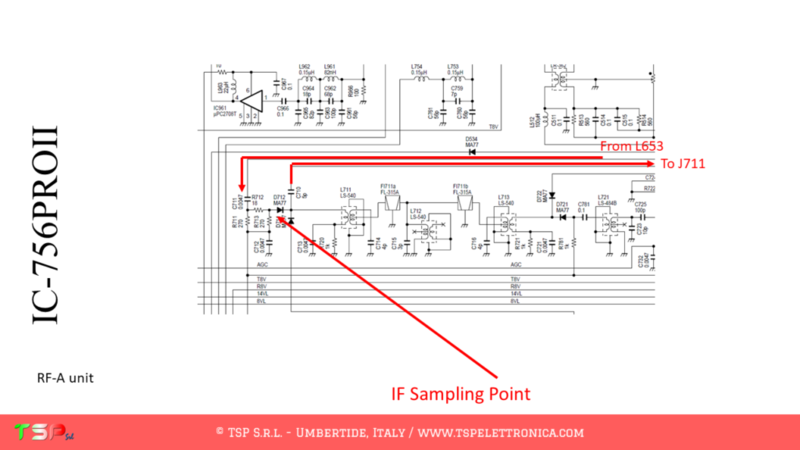 Let’s start by identifying within our radio the point where to take the medium frequency signal. 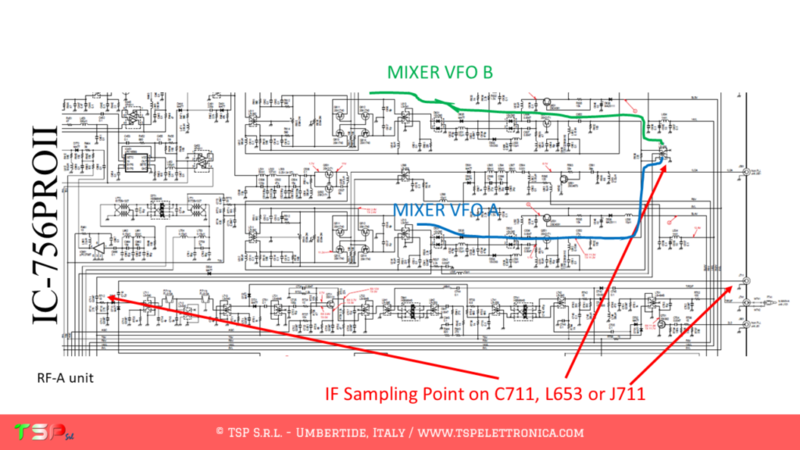 This is between the output of the first mixer and the subsequent bandpass filters as shown in the following image. During the reception the difference is strong, listen here. 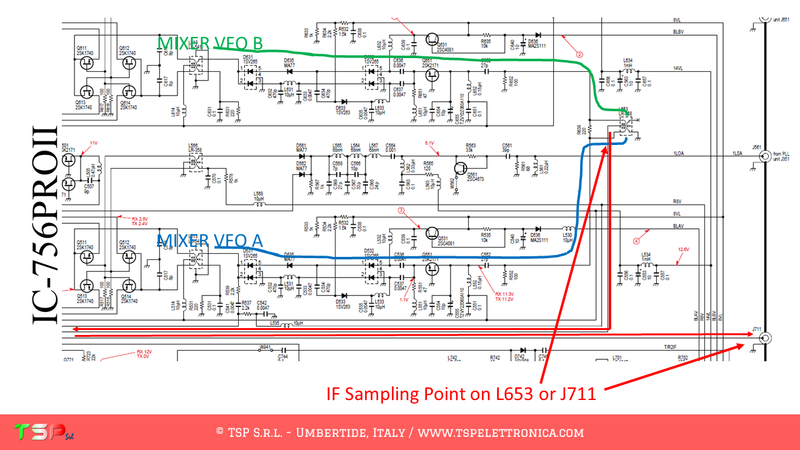 In order to not alter the operation of our receiver, we must pick up the signal without charging the mixer, i.e. without taking power. For this reason we have to insert a special card between this and the external receiver: we can not connect it directly. 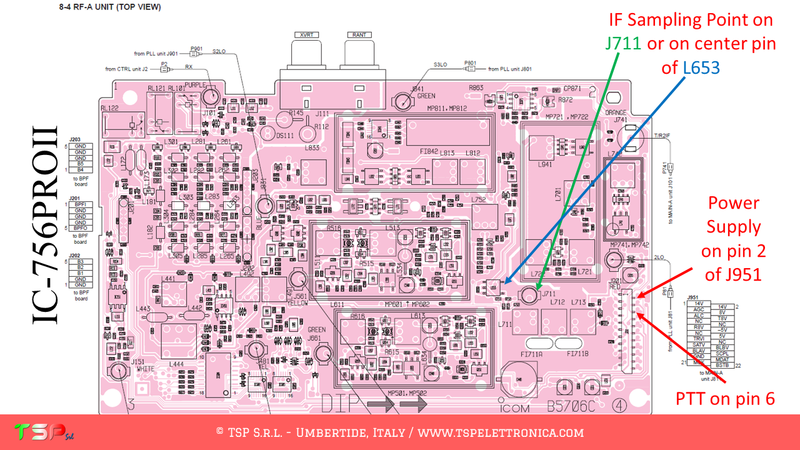 The IF signal pick up card, the IFace, creates a copy of the signal to be sent to the external SDR receiver. This is a wideband and no-tune buffer, i.e. no calibration is needed, it is installed and it is ready to work. The usefulness of this circuit is to allow the medium frequency signal to be replicated without increasing the load seen by the source (the mixer) and therefore without changing its performance. 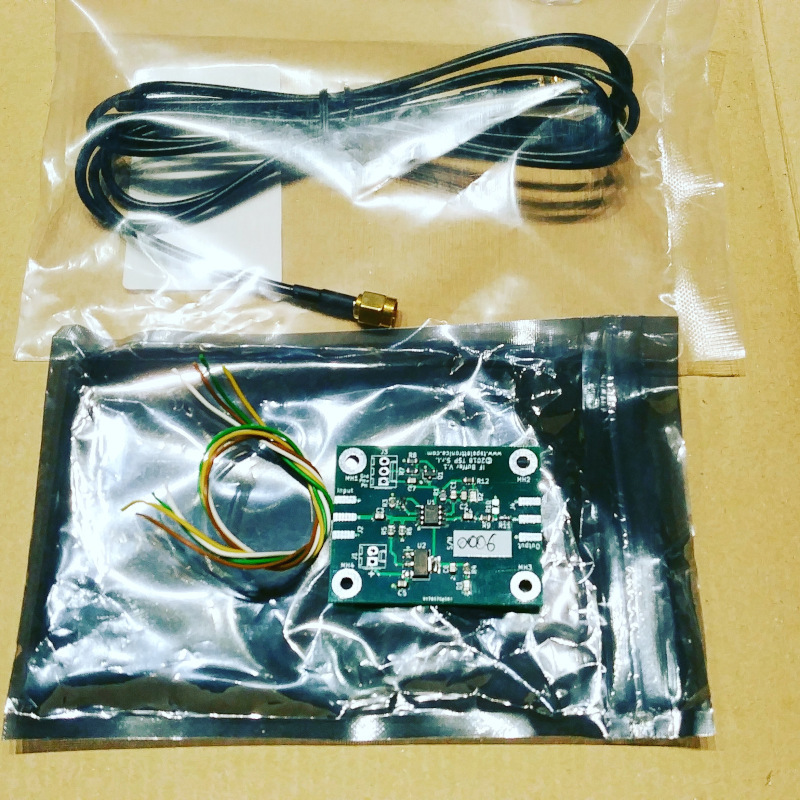 Once the IF signal has been obtained, it is sufficient to connect the A / D converter (an RTL-SDR is already more than enough) to the USB port and start the software for the reception (ex HDSDR, SDR #, SDR Console etc) and our RTX will now be equipped with a nice panoramic receiver. Are you already convinced? Very well, buy an IFace immediately by clicking on the button below! 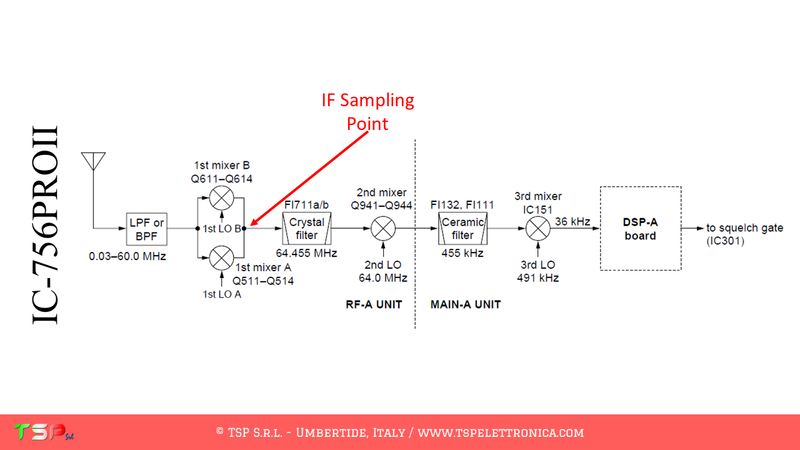 There are numerous advantages in picking up the IF signal and not the one coming directly from the antenna: one of these is surely the fact that the amplitude of the signal is controlled through the AGC circuitry of the reception stages. 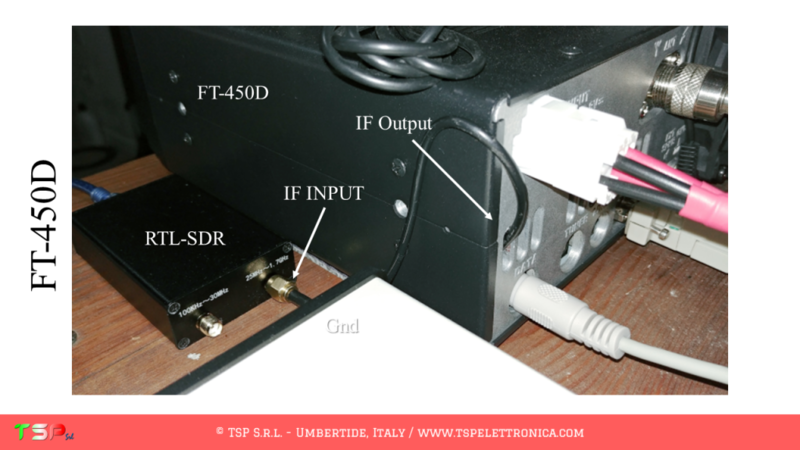 This helps to prevent saturation of the dynamics of RTL-SDR (which is not known to be the most extensive). 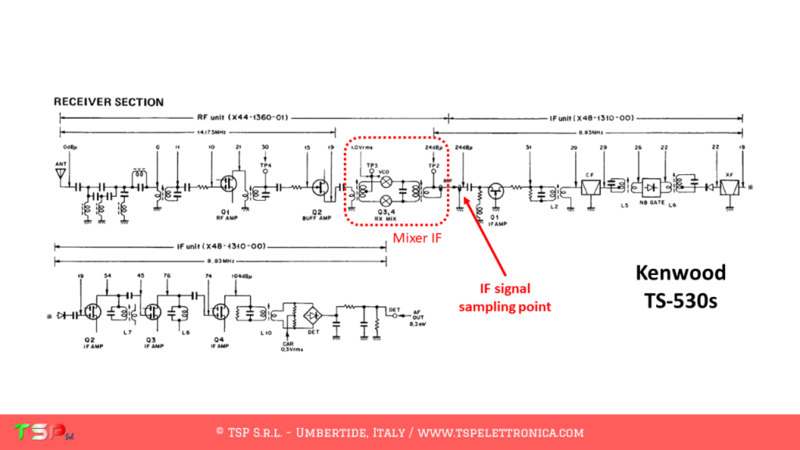 The point where you take the IF signal is easy to find, just take the schematic diagram of your radio and look for the first mixer: at its output you will find the signal of interest. 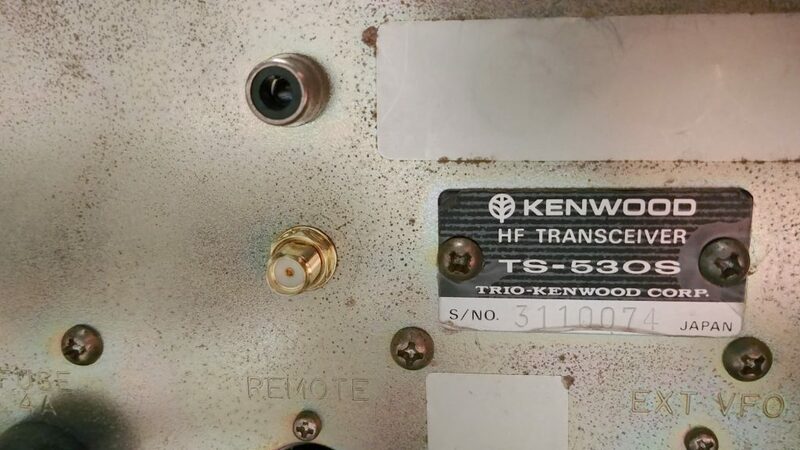 The image below shows the point where you have to connect the IFace interface in the case of a Kenwood TS-530s, a radio of a few decades ago, which can be easily updated with this interface. 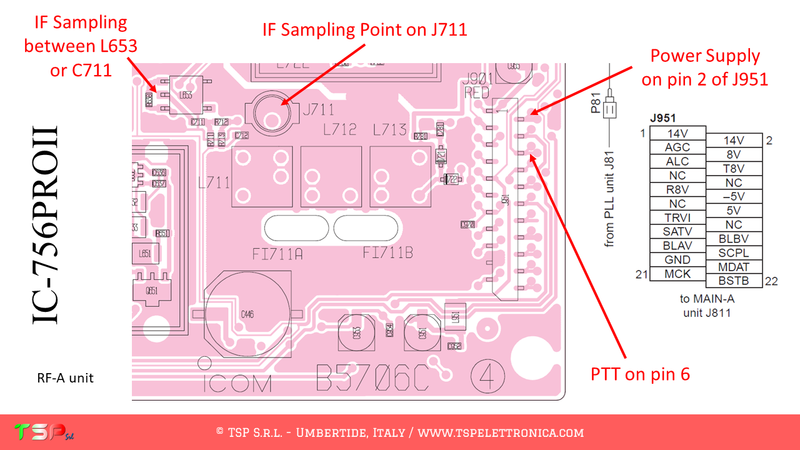 The connection to the chosen point can be made with a thin coaxial cable (type RG178 or RG316) and will terminate at the “Input” pad of the IFace. If the connection is very short, a coaxial cable may not be necessary. 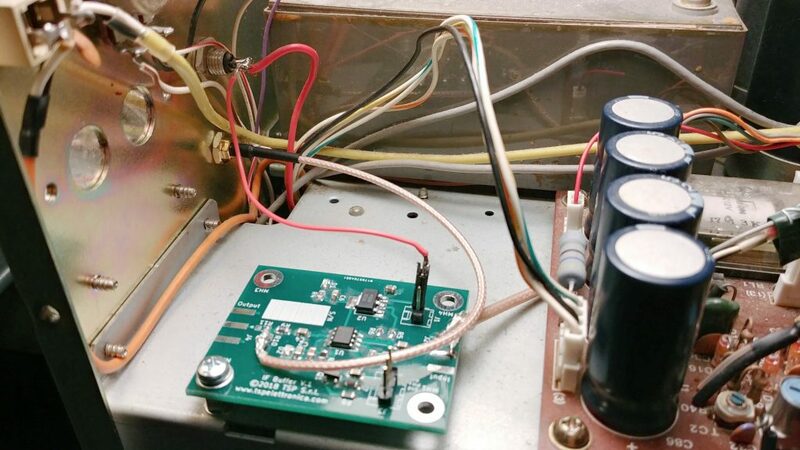 The “Output” instead will be connected with another small coaxial cable to the input of the chosen SDR receiver. 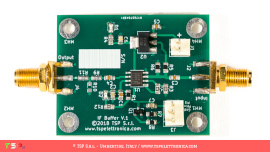 Obviously the buffer must be powered: it will not be difficult to find inside the radio a point where to draw a voltage of 9 Vdc or 12 Vdc. The following images show how easy it is to install the IFace into the TS-530s. 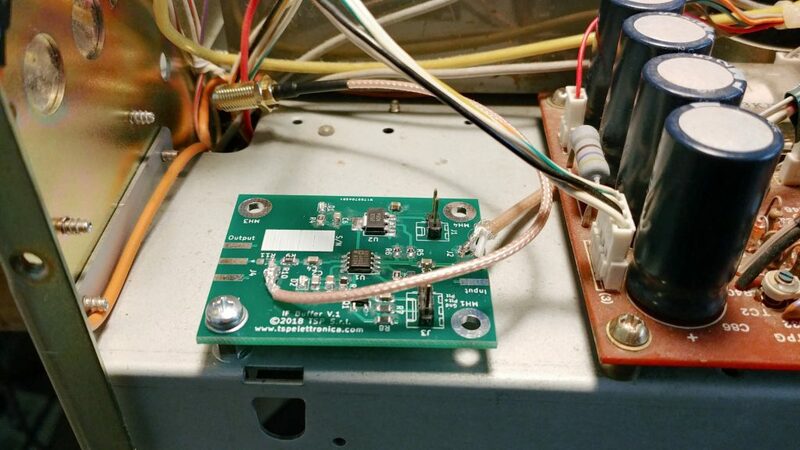 After making these simple wiring, you can connect your SDR receiver and start the reception software. 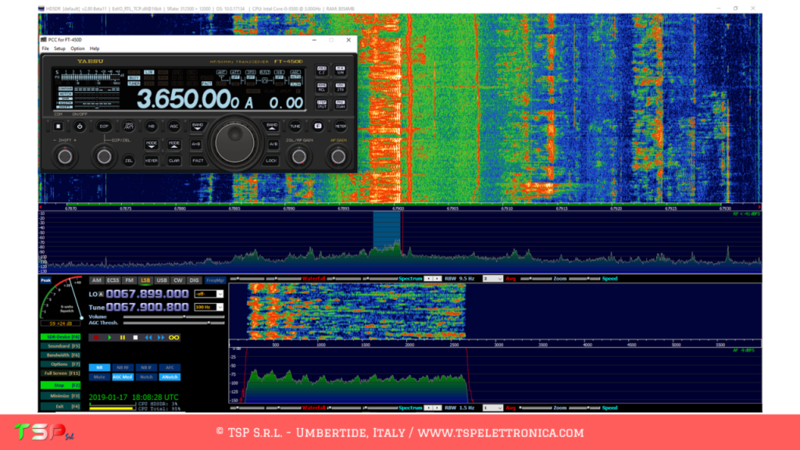 The following image shows the SDR# screen during the reception with a Kenwood TS-530s (its intermediate frequency is 8.83 MHz) and an economical RTL-SDR. Another IFace has been installed in a YAESU FT-450D. 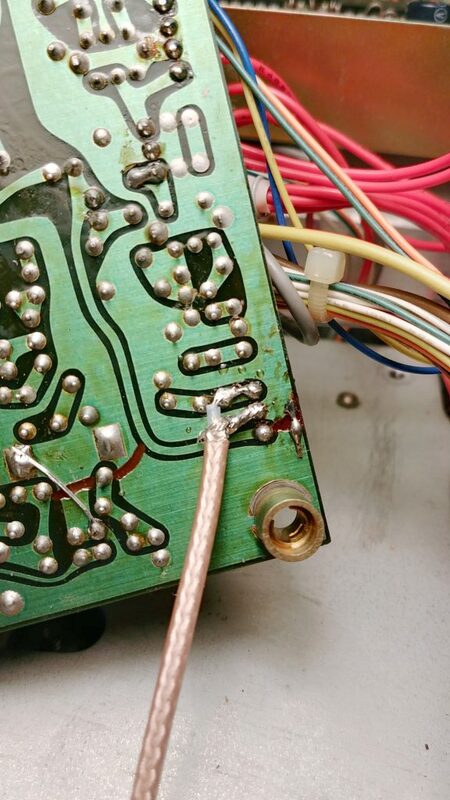 As you will see from the photos, the space occupied is very little and the time required to connect the 4 conductors (+13 V, Gnd, Ptt +, IF) is a few minutes. 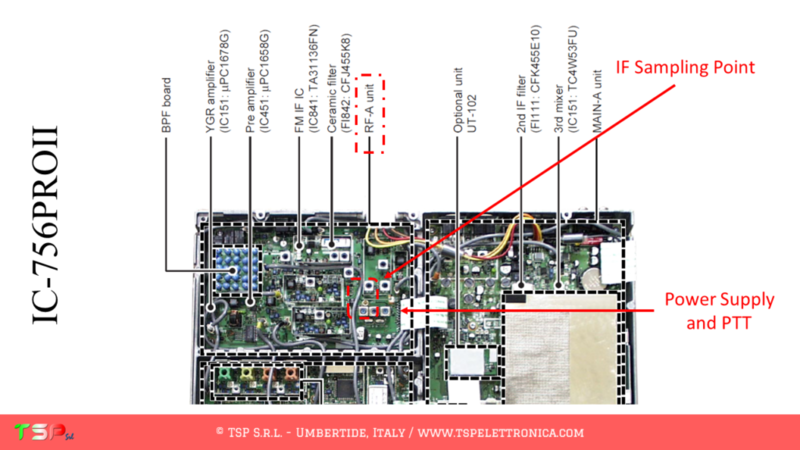 In this case the Ptt signal was used, that is the “TX” signal present in the IF-UNIT of the radio. All this clearly appears in the following images. Did this finally convince you? Buy an IFace by clicking on the button below! 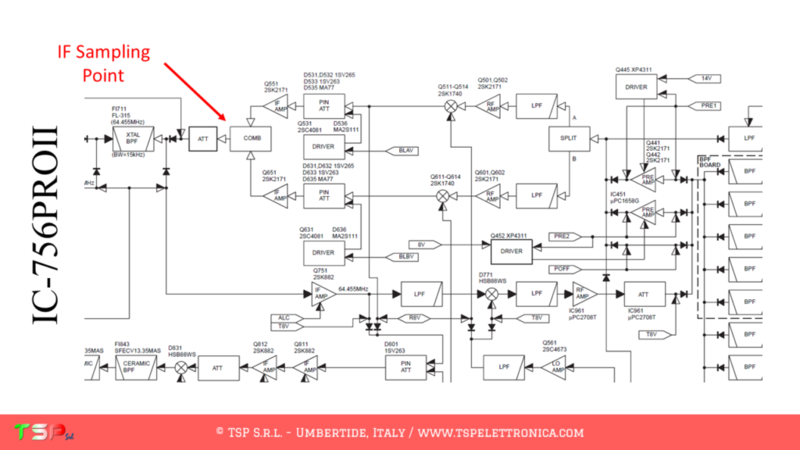 In case you do not want to display any signal during transmission it is possible to turn off, by sending it into power down, the buffer of the IFace through a special input pin (PTT) as shown in the following picture. To be more accurate, an active high PTT, i.e. 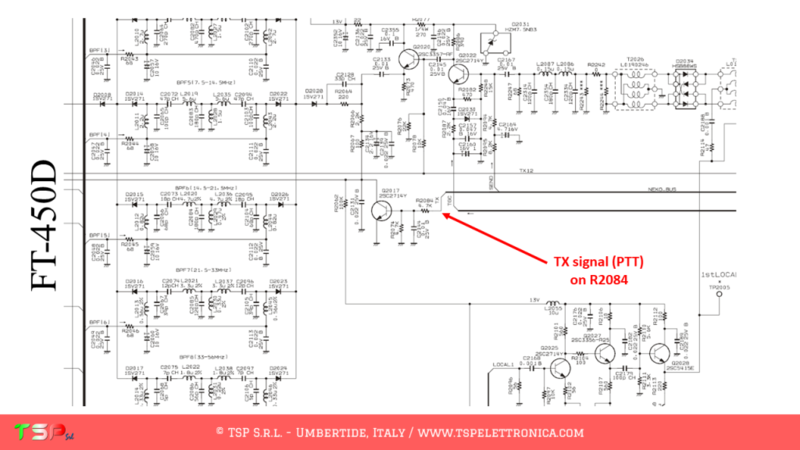 the signal is at 12 V when transmitting, or an active low PTT, i.e. 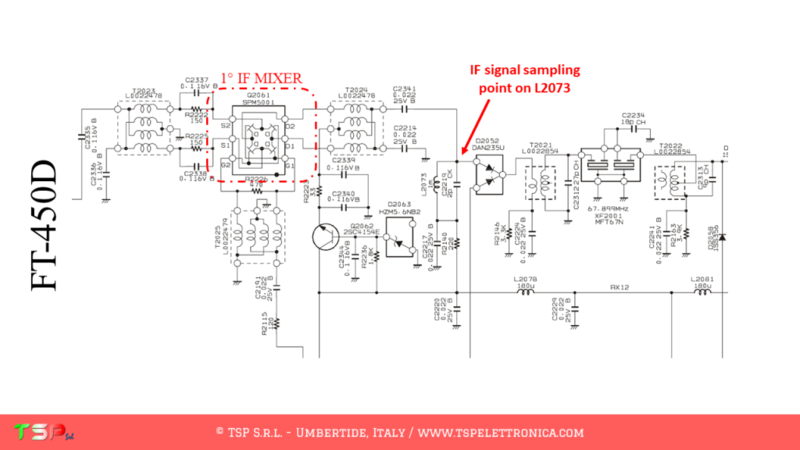 the signal is at 0 V when the radio is transmitting, can be used . 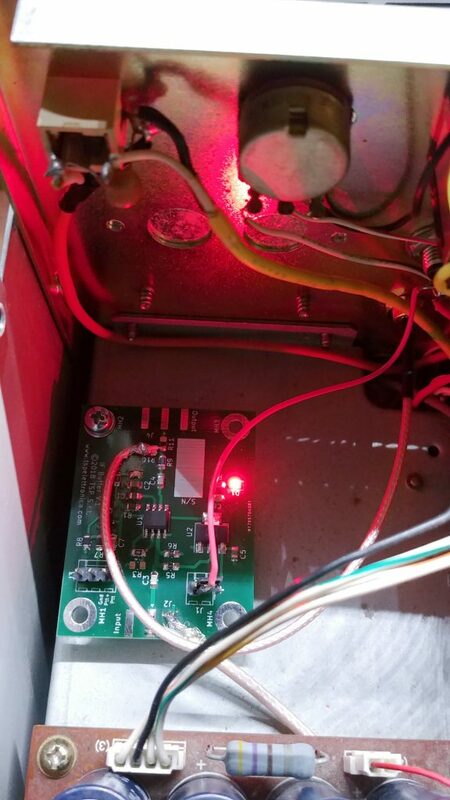 The following video shows how the card reacts to the pressure of the PTT, that is when the radio changes from reception to transmission: the red LED indicates that the card is in power-down because the radio is transmitting. If you were still not convinced of the goodness of this interface look at this other video where you can see how the IFace works when added to an old Kenwood TS-530s. 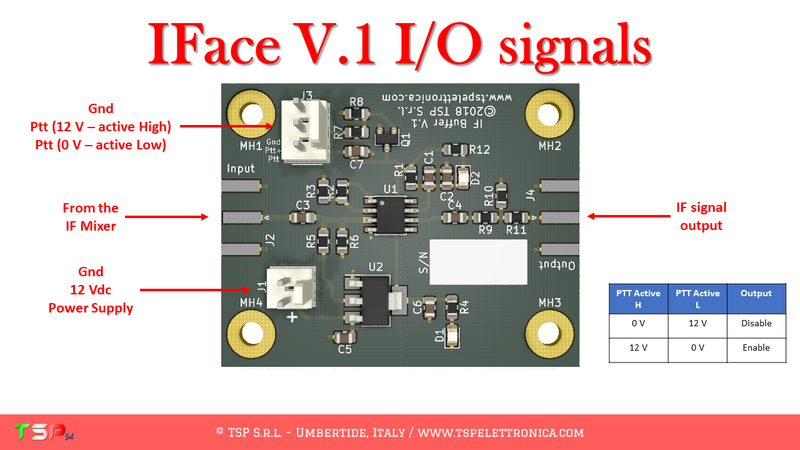 The price of IFace is only € 42.90 including VAT (22%) + shipment costs. We cannot guarantee a stable price for long time. By ordering now you will have the best price possible. 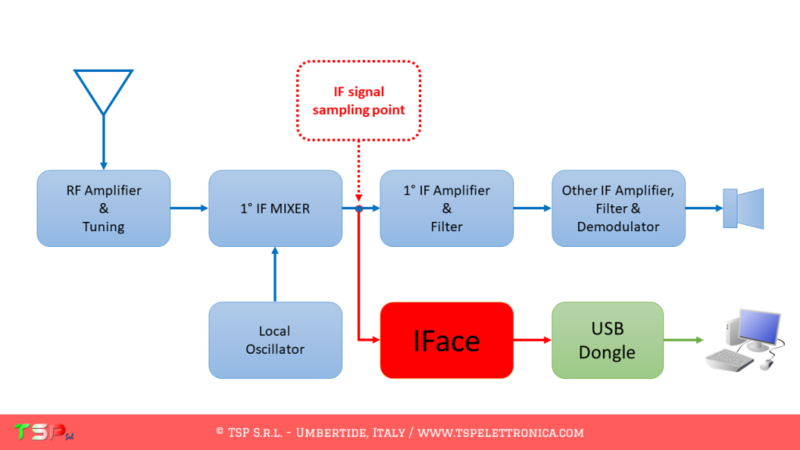 In this page you can find the list of the instructions to install the IFace into your radio: it is continuoursly growing. For those radios that are not included yet, send a request so that it can be entered as soon as possible. 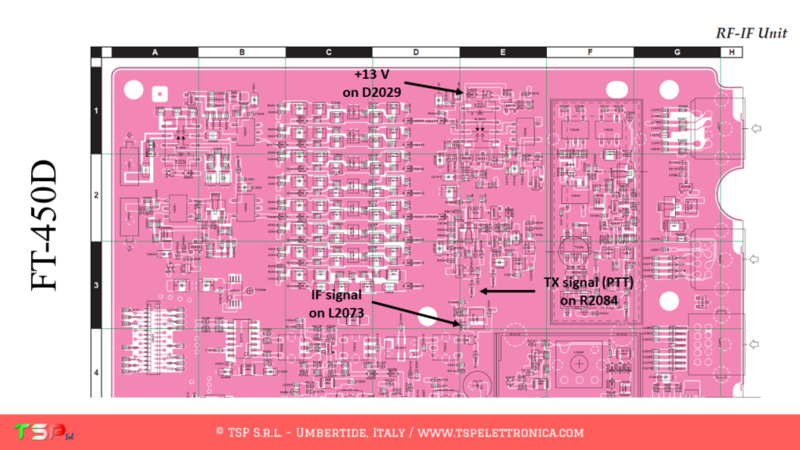 four wire to connect the board to the PTT, IF and powering points on the radio (colors of the wires may be subject to change). Order now by clicking on the following button and have fun. Any question? Please use the following form.